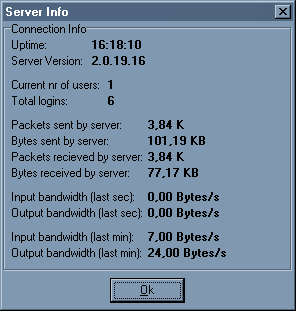 In this menu server related statistics are shown. It show the uptime, server version, current nr. of users and total logins. Below that traffic totals and bandwidth statistic are shown. When highlighting the servername and right-clicking the mouse you can access this menu via a popup menu too. The information shown here comes straight from the server itself.